Sports, especially but not only competitive sports, have been known for generations to be valued tools in the development of fitness, teams, and leadership. In the military we understood very well the importance of using teams and “being a team player” long before these terms became buzz words in the Business Schools of the world. The “New One Hundred” cadets in the first postwar class at RMC in 1948 faced a unique reality. There were no established sports teams to join. Like circumstances prevailed at Royal Roads. RR had been a naval college but now, like RMC, it became a Tri-Services College. This would be “Team Building 101” for players, coaches, and administrators at both institutions. . Nevertheless, the spirit, energy, and dogged determination demonstrated by all our athletes in these early post-war years would put RMC back on the intercollegiate sports map in fairly short order. 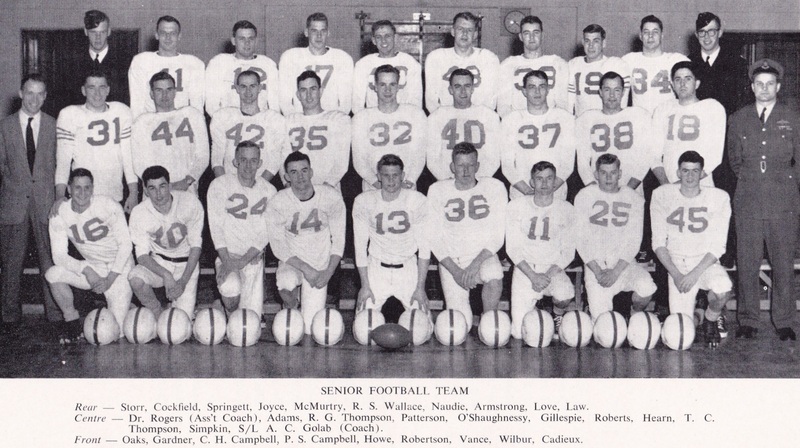 The early days of post-war football at RMC saw coach Captain Tom “The Wheel” Wagstaff work with what he called “the material we had” with a relatively small number of players to draw from. Captain “Spike” Malone coached the ends and Sergeant Curtis ensured that players remained fit. The first two seasons (1948 and 1949) involved putting a team together to play exhibition games and be readied to re-enter intercollegiate competition. Meanwhile, thanks to the initiative of Bill Ferguson with the assistance of Robin Bourne, a junior team was also established to provide experienced reinforcements for the senior team and replacements for graduating players. Meanwhile at Royal Roads, because most of the incoming athletes from across Canada had played Canadian football, RR dropped its traditional English Rugby game in favour of the Canadian game. Chaplain Edwards (RCN) who had played at U of T, with the Hamilton Tigers, and with RCN in Nova Scotia, coached an RR team that went undefeated in their league. RR would indeed be providing proven reinforcements for the football program at RMC. The Fall of 1950 became historic for RMC and Royal Roads. As was intended, many RR cadets relocated to RMC for the final two years of their studies and joined their RMC cohort. Though many had met each other during summer training with the Canadian Forces this was the first time ever that all Third Year cadets came together at RMC. The athletes from RR were welcome additions for RMC’s various teams, football in particular. RR footballers including Joe Laudenbach, Dan Loomis, and others arrived from RR to support those already playing at RMC. A few recruits with football experience would also come on board. The team, now bolstered by new talent, would indeed become more competitive. In 1950 RMC joined the Ottawa St. Lawrence Conference (OSLC), a member of the Canadian Interuniversity Athletic Union (CIAU). The RMC Redmen completed their first OSLC season scoring victories in games against Bishop’s, Macdonald College, and Carleton, a tie with St. Patrick’s College, and suffering defeat against the powerhouses of the League, Queen’s, McGill, and Ottawa U. A satisfying beginning, but still a work in progress. Through this uphill climb back to the top our team had played some very good football even in defeat. Coach S/L Tony Golab of CFL fame would later lead the team to its first Intercollegiate Football Championship in the “A” Division of the OSLC. A group of superb young men put their all into ensuring that our opponents on the field, whether at home or away from the College, would understand that RMC would compete fiercely and do so to the final whistle. To name just a few of the many in these early days of the post-war era (some earned nicknames of course): Cam “Stinky” McIntyre, Dan “Chubby” Loomis, Johnny Waterson, “Big John” MacLachlan (Co-captain), Joe Pagnutti, Terry “Dogger” Hoffman, Jim “Sinc” Sinclair, Sid Lundell, Palle Kiar, Joe Laudenbach, Walt Scott, John Kormylo, Don Green, Glyn “Classy” Osler and we could go on and on. Several memorable exhibition games made all of us really proud. 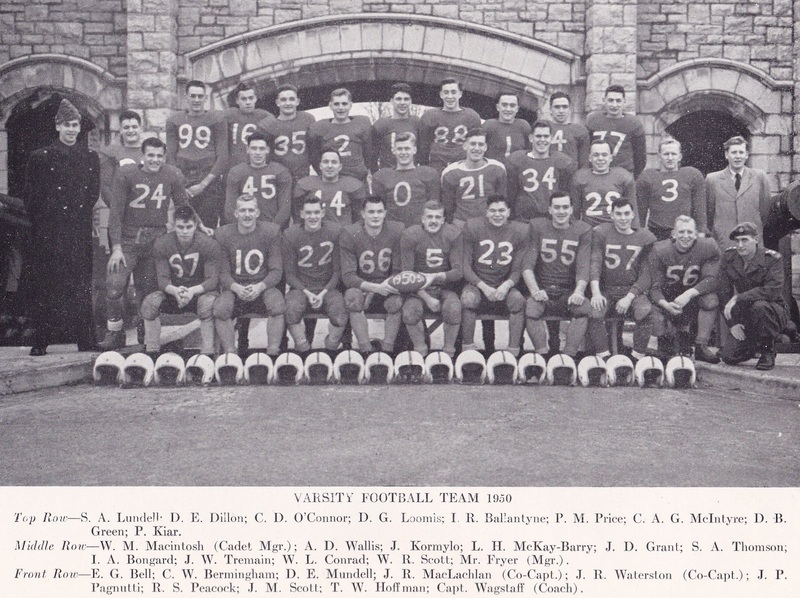 On Thanksgiving weekend in 1953 the team visited Halifax for two exhibition games played before the largest crowds ever to have witnessed Canadian football in the Maritime Provinces. The Redmen defeated HMCS Stadacona, then leading the Nova Scotia Football League, and followed that win with a victory over Dalhousie University, the League’s defending champions. 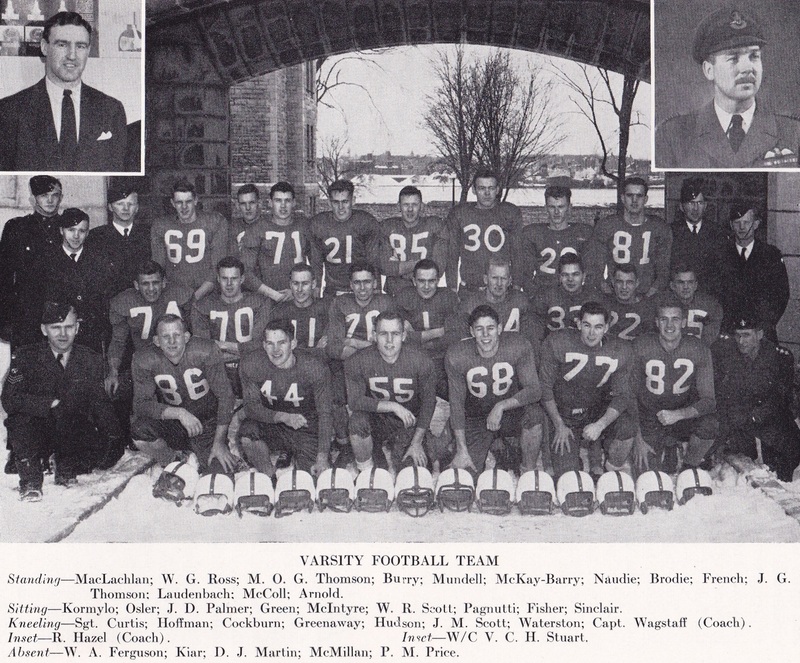 And in 1954 the team travelled to Winnipeg for an exhibition game against the Weston Wildcats of the Manitoba-Saskatchewan Junior Football League. More than 10,000 spectators were in the stands at Winnipeg Stadium. Colour parties from all three services and also from RMC participated in the Opening Ceremony. Additional military personnel impressed the crowd at half-time. Our team played its best football ever that day but suffered a 13-6 loss at the hands of one of the strongest junior football teams in Western Canada. A really great day for the team, for the College, and for recruiting prospective Officer Cadets. At some point I began to realize how very fortunate I was to be able to be associated in any way with these exceptional athletes. I knew they would make good officers, good leaders whether in the military or in the business world, and certainly good citizens and good parents. It would not be long before we would all learn that a few of our seniors would be decorated for gallantry in war. Outstanding men on the gridiron. Extraordinary leaders in battle. In one of my several lives after military service I spent many years teaching Leadership and other Business courses in Universities and Colleges in Canada and abroad. Many principles of war can also be applied to the business world. We would also see some of the youngsters on the early football teams eventually reach prominence in the military and business in later years. 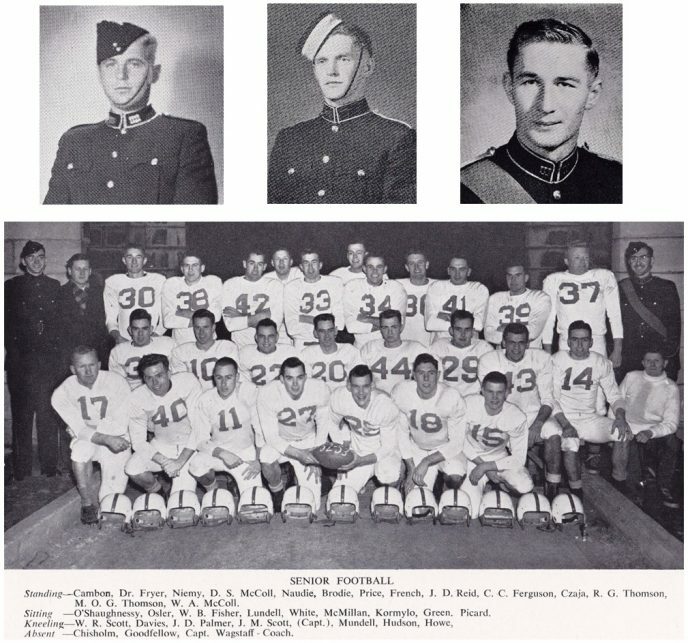 3542 Walter Niemy (RMC Senior Football Team 1952-55), RCAF, fighter pilot, test pilot, commander of the Aerospace Engineering Test Establishment, Commandant of the Royal Military College, VP of Canadair, President of Bombardier Defence Systems Division. Brigadier General Niemy passed away in June 2017. H3536 Jack Vance, (RMC Junior Football Team 1952, Senior Football Team 1953-54) Royal Canadian Regiment, would become Vice Chief of the Defence Staff in 1985-1988. 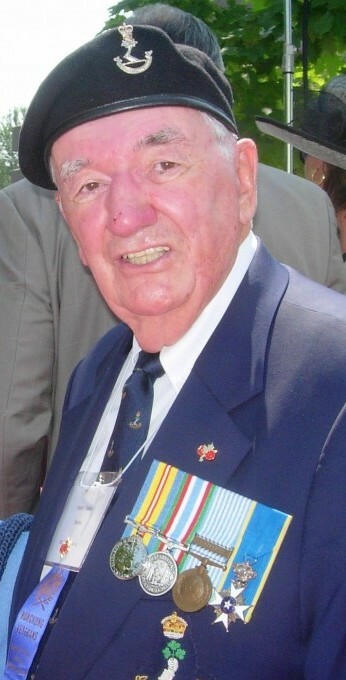 Lieutenant General Vance, father of current Chief of the Defence Staff General Jonathan Vance, passed away in September 2013. Football surely was of influence in developing leadership qualities that led to such success. Coming soon: Football II, Soccer, Track and Field, Harriers and more. Stay tuned. Feedback please!